Hacked private emails of the US general formerly in charge of NATO reveal a campaign to pressure the White House into escalating the conflict with Russia over Ukraine, involving several influential players in Washington. The emails, posted by the site DCLeaks, show correspondence between General Philip M. Breedlove, former head of the US European Command and supreme commander of NATO forces, with several establishment insiders concerning the situation in Ukraine following the February 2014 coup that ousted the elected government in favor of a US-backed regime. The hacked emails reveal his frequent and intense communications with retired General Wesley Clark, as well as former Secretary of State Colin Powell, and involving a senior fellow at the Atlantic Council, State Department official Victoria Nuland, and US Ambassador to Ukraine Geoffrey Pyatt. Clark, who commanded NATO during the 1999 war in Yugoslavia, reached out to Breedlove in April 2014. On April 8, he forwarded “intelligence” obtained by Anatoly Pinchuk and Dmitry Tymchuk, activists close to the new regime, claiming a Russian invasion was in the works. The information was conveyed by Phillip Karber, an ex-Marine and president of the Potomac Foundation, whom Clark calls a“colleague” and “our guy.” Karber wrote about observing the Russian border from inside a Ukrainian tank, and eagerly transmitted Tymchuk and Pinchuk’s calls for support. Contacted by The Intercept on Friday, Karber confirmed the authenticity of several emails in the leaked cache. In an email dated April 12, Clark referred to his exchange with “Toria” Nuland – the assistant secretary of state for Europe and Eurasia, who personally backed the Ukrainian revolution – pushing for open US support for the regime in Ukraine to use force against protesters in the east. Prior to the coup, Washington had strongly warned Kiev not to use force against the anti-government demonstrators in the city. Kiev’s summer “anti-terrorist operation” ended in crushing defeat in August, and the first armistice between the government and rebels was signed in Minsk in September. Meanwhile, the so-called Islamic State jihadist group arose in Iraq and Syria, drawing US attention away from Eastern Europe with gruesome beheadings of Westerners. Frustrated by the White House’s reluctance to back his belligerent agenda in Ukraine, Breedlove reached out to Powell, a retired general and former secretary of state. “I seek your counsel on two fronts,…. how to frame this opportunity in a time where all eyes are on ISIL all the time,… and two,… how to work this personally with the POTUS,” Breedlove wrote to Powell in September 2014. Powell’s response was not made available. Breedlove was introduced to Powell by Harlan Ullman, a senior fellow at the Atlantic Council and the author of the“shock and awe” doctrine used by the Bush administration in the 2003 invasion of Iraq. In October 2014, Ullman urged Breedlove to reach out to Vice President Joe Biden. Aside from Powell, Ullman wrote,“I know of no better way of getting into 1600,” referring to the White House’s address on Pennsylvania Avenue. “Obama or Kerry needs to be convinced that Putin must be confronted,” Ullman wrote in February 2015, before the ‘Minsk II’ talks. He also gave Breedlove pointers on getting into the good graces of Ash Carter, the new Defense Secretary. “I would take or pretend to take careful notes. Ash is an academic. And he is trained that students who take good notes rise to be A grades. This may be maskarova. But it is useful maskarova,” Ullman wrote, misspelling the Russian word for camouflage (maskirovka). 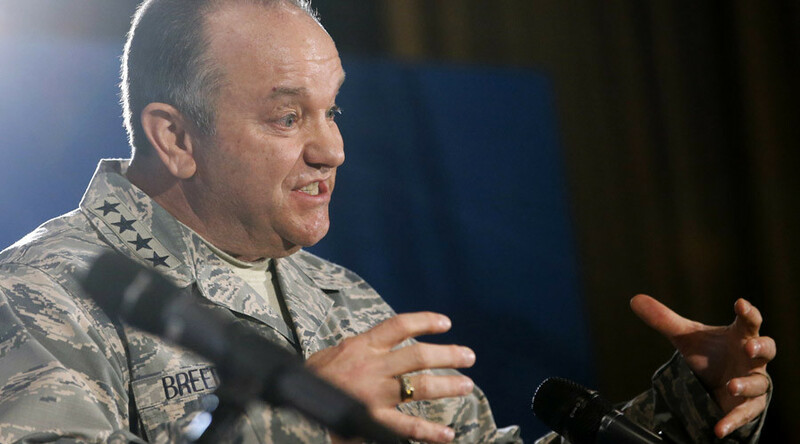 Breedlove was replaced at the helm of EUCOM and NATO in May, and officially retired from the military on July 1. He was replaced by US Army General Curtis Scaparrotti, whose public statements suggest a similar level of hostility for Russia.